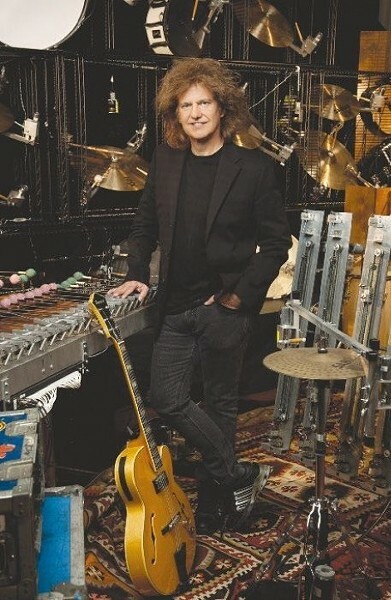 Pat Metheny has been the recipient of that comment more than once, but his music is remarkable both for the way his playing soars above the great number of guitarists noodling away, and the way it becomes transparent and somehow attains sheer music without the image of instruments or players trying to out-solo each other, the malady to which much jazz tends to fall prey. Perhaps it’s due to his deep immersion in music at an early age. The 55-year-old musician, born in Lee’s Summit, Mo., into a musical family, was already teaching at the prestigious Berklee College of Music in Boston when barely out of his teens. Not long after, he was cutting album after album for the German label ECM, known for its impressionistic jazz soloists, before later moving to Warner Bros.
Three gold albums and 17 Grammy Awards later, he has made a name for himself as one of the most successful and influential musicians in the world, incessantly touring, known for his sprawling, sometimes orchestral compositions and eclectic approach, venturing out of the listener’s comfort zone to make noise albums like Song X with saxophonist Ornette Coleman and Zero Tolerance For Silence, incorporating drum ‘n’ bass influences. There’s something about his fluid, easy style of playing and composing that belies his Midwestern origins; comfortable and very American, somewhat like Aaron Copland. His music can sometimes be a little too easy on the ears, because he is played on soft jazz radio stations. His most recent album, Orchestrion, finds him on a completely new project: Besides his own guitar playing, all the music on the disc was created by instruments controlled by solenoid switches and pneumatics. It hearkens back to the sounds of his grandparents’ player piano and other instrumental experiments of the 1800s, and questions what role technology will have in music tomorrow. These songs don’t break ground musically as much as technologically. You might not associate such a tirade with the guitarist associated with placid, sunny sounds as Metheny, perpetually smiling while on stage like a kid let loose in Santa’s workshop, but it’s a testament to Metheny’s passion and studious devotion to music as an art form.